A family run business since 1953, Joe Randazzo's carries the freshest fruits and vegetables from around the world at the best possible price. 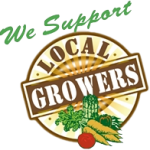 We also carry specialty ethnic products, fresh roasted peanuts, imported pasta, olive oil, bread, dairy products, fresh flowers, seasonal and vegetable plants. © 2019 Joe Randazzo's Fruit & Vegetable Market. Website Design.